wedding invitations | come blow bubbles! well, i’ve had a few people ask about weddings/my wedding invitations recently, and i realized i had never documented them, so last night i decided to take some pictures of them. brandon and i designed, printed and assembled them all by hand–truly a labor of love. first, our save the dates…we took the picture in golden gate park, near where brandon proposed. 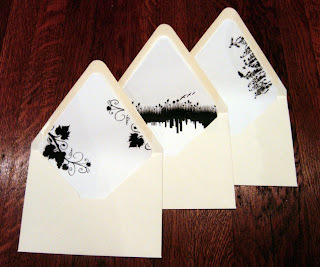 and then for the final product, the actual invitations. the names have been blurred for privacy, in case that was a point of confusion–no, we didn’t have gray smudges on our invites. 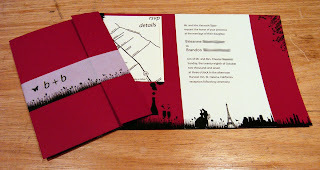 on the left is the invitation how it would come out of the envelope–folded up with the band around it. 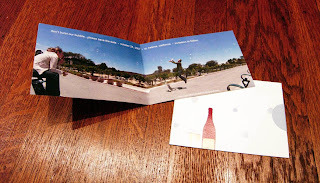 on the right is the unfolded invitation. the left side had a pocket which held the rsvp card and map/directions/additional information card. 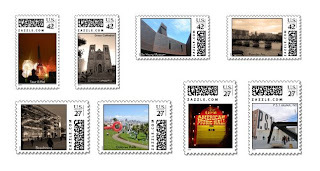 we also decided to “splurge” and purchase custom stamps from zazzle. overall, they were extremely time consuming and stressful at times, but i think we enjoyed making them, and at the end of the day i was glad we customized ours so much. i really feel our invitations represented us, and i like that there are no other invitations out there exactly like ours.